Product prices and availability are accurate as of 2019-04-24 05:25:34 UTC and are subject to change. Any price and availability information displayed on http://www.amazon.com/ at the time of purchase will apply to the purchase of this product. Animal friends from around the planet twirl and smile down at baby as music plays and a fascinating light show dances up above. The delicate canopy keeps images close, so it’s easier for young babies to focus. 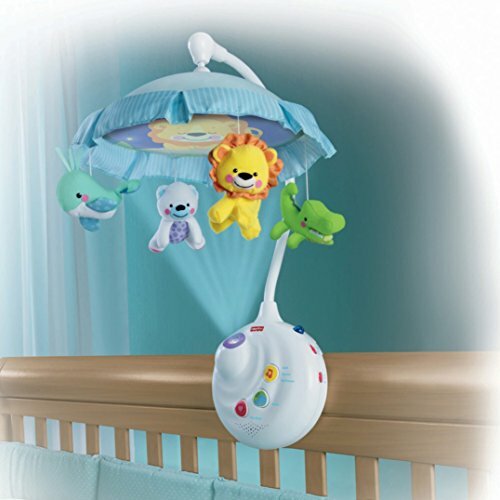 As baby grows, you can remove the mobile and project the show on the ceiling, with sweet music or sounds playing along. Includes remote control. 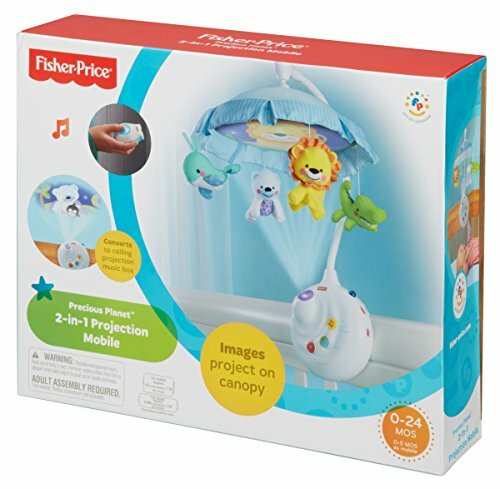 Designed for use from birth up to five months, the Fisher-Price Precious Planet Two-in-One Projection Mobile is unique among mobiles, because it combines music, plush animal figurines, and movement with a soft projection of light. 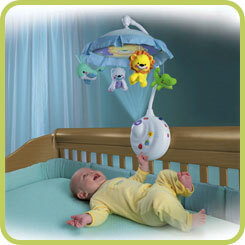 Both entertaining and soothing, the Projection Mobile is perfect for playtime and rest time. It includes a remote control and requires two "AAA" and four "D" batteries. Images project on canopy for younger babies. 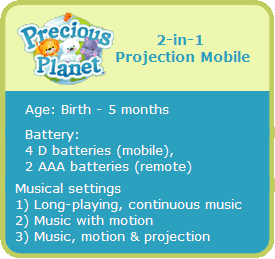 Converts to music box with ceiling projection for older babies. 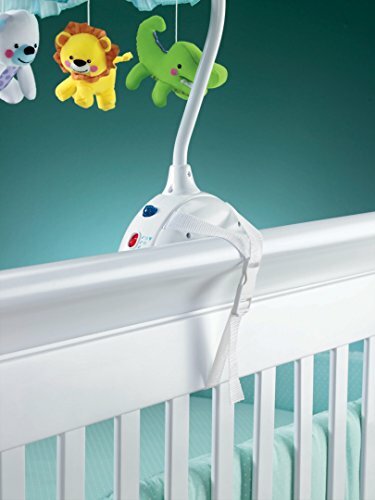 Innovative attaching method fits more cribs! Restart the mobile without disturbing baby! The Projection Mobile features a colorful animal-themed design, sweet music, and a fascinating light show that dances up above. 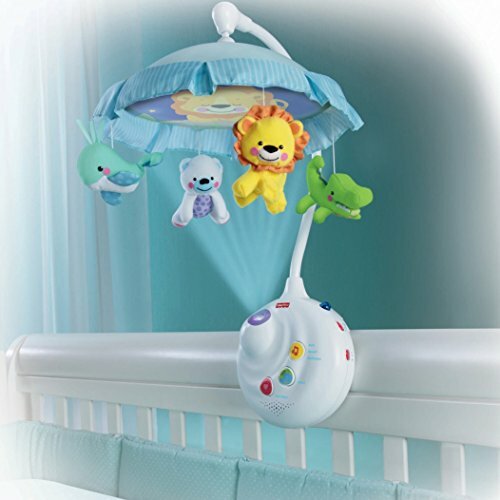 The delicate canopy keeps images close, making it easy for young babies to focus. And when your baby grows, you can remove the mobile and project the show directly on the ceiling, with music or sounds playing along to add to the fun. To help your baby learn to focus and to support healthy visual development, the Projection Mobile includes four plush animal toys with spinning antics that are sure to delight and calm your baby. 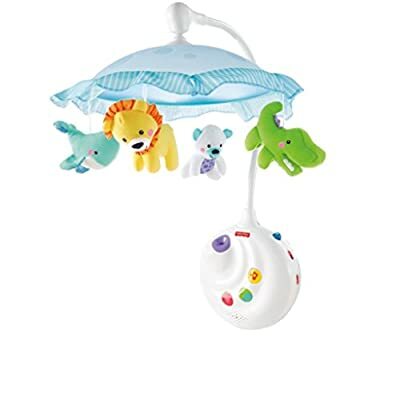 A teal whale, white polar bear, green alligator, and yellow lion keep your baby interested with their detailed designs and friendly faces. Babies will want to reach up to touch one or all, and parents can join in the fun by naming each animal and explaining where it lives. As your baby watches the animal antics, you can choose up to a full 20 minutes of music to either soothe or engage her senses and to help develop her auditory skills. Customize your baby's experience and match her mood by choosing from classical lullabies from Bach, Beethoven, and Mozart, nature and ocean sounds, or heartbeat and white noise womb sounds. The Projection Mobile measures 23.5 x 17.0 x 18.0 inches (WxHxD) and weighs just five pounds. 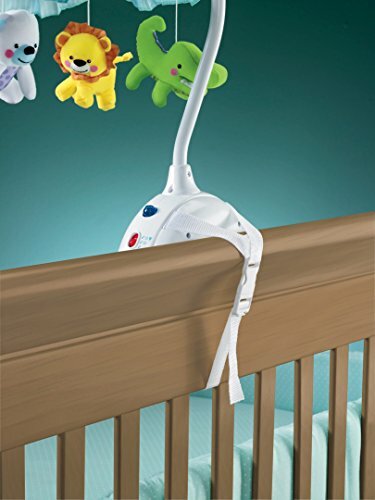 It attaches securely to any crib with an improved, stable mechanism, and it comes with a remote control. To operate, the mobile requires four "D" batteries, while the remote requires two "AAA" batteries. A subsidiary of Mattel, Inc., Fisher-Price manufactures a range of fun, educational, and developmentally appropriate toys for babies, toddlers, and preschoolers. Founded in 1930 by Herman Fisher, Irving Price, Margaret Evans Price, and Helen Schelle, Fisher-Price has created approximately 5,000 different toys. Now headquartered in East Aurora New York, Fisher-Price's guiding principles haven't changed. The company still focuses on each toy's intrinsic play value, innovation, and safe and sturdy construction. Some of Fisher-Price's top-selling lines include the Little People toys, Power Wheels, and the Chatter Telephone, as well as an assortment of Disney, Sesame Street, and Barney toys marketed under the company name. Fisher-Price also designs and sells infant care products and electronic toys for preschoolers.